I do not claim to have learned all there is to know about wealth. I myself am on a quest for knowledge and the total transformation of my life. Yet, I want to encourage every woman who is not living her financial dream to seek out advice, tips, books, instructors, etc., so they, too, can change their lives. The above picture is my actual change jar. It takes me a year or two to fill with my leftover change. Once it’s full, I take it to one of those machines in the supermarket that counts it for you and collects a small fee in the process. I know. I should take it to my bank. See! I’m not a financial advisor. But, I am a mom who wants to leave a legacy. Wealth is such a personal thing. I mean it’s relative right? Sure, some inherit it, but somebody somewhere had to first take a chance in the right direction and add in some hard work to build that pile of assets to, in turn, pass along. I truly believe that as long as we have breath, we can change our lives for the better. That includes finances. The Bible says in Proverbs 13:22 “A good man leaveth an inheritance to his children’s children.” Wow! I want to do that! Don’t you? It may not happen for me or you the way it happened for others, but the truth is we need to start building (if we haven’t already). I like to listen to a few folks on advice for saving. The Bible says, “There is wisdom in a multitude of counselors”. I say there is confusion in not having a plan. As a single mom, I have seen lack and abundance (my scale may be just getting by). It (life) has been smooth and it has been rocky. 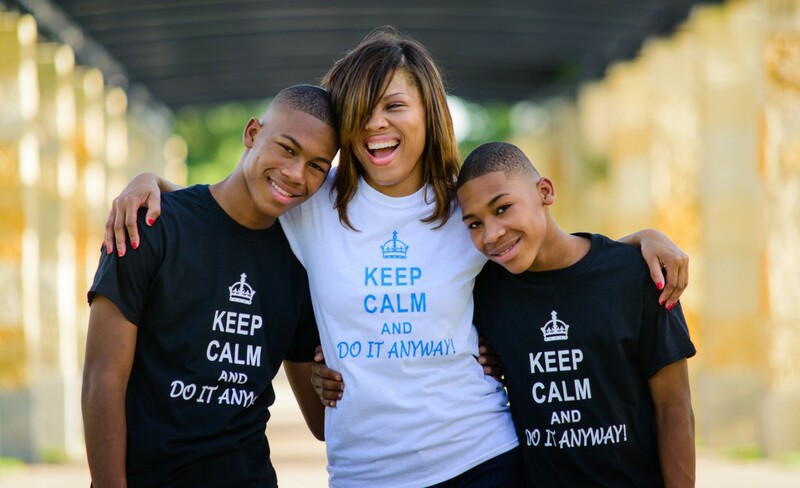 But, GOD has kept me and my boys. He has been faithful. Because of this, I like to be faithful with what he gives me. So, I believe that part of wealth creating is giving. I can’t say I always tithe like I want, but I give. I have charities I support. It makes me feel so good inside to help someone else in need. Try it. It’s amazing how even our little is sometimes greater than what some one else has. If giving money is not feasible, please find time to show your kids how to give back to others by you all doing charitable work. If money is not a problem, consider mentoring other women on wealth creation. We are blessed to be a blessing. Side note: The sense of entitlement of the youth these days is at an astronomical level. Even my own kids have tried to act as if the world owes the something. I quickly nip that in the bud. I have them help me serve, and I have them give away toys and clothes. I also had them pick out the boy we sponsor in Africa who is around their age. I talk to them about how blessed we are knowing that they don’t fully understand yet. But, I know one day it will be clear. As I work to build something to leave them, I want to leave my wealth to men who know how to handle it and who know the blessing they hold. 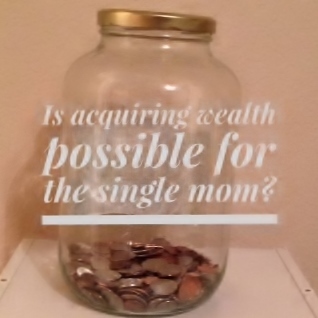 So moms, even if it’s five bucks a week, start saving now. Try the change jar idea. Or, refrain from the delicious $5 coffee for a few weeks and watch it add up. We have more than we think even when to us it is not enough. Saving is a family affair. Get everyone in on the conversation. Make it a contest if you can, but by any means, save. I pray this post blesses you and your family, and you get started on building your empire. “Saving is hard, and I have bills,” you say. Why do we have Mondays any way? Monday’s are really hard. Aren’t they? The getting up and getting going takes a while because the bed was so warm, the sleep was so good, and the weekend so short. The lovely first day of the week calls and get up you must. Work awaits. School awaits. Life awaits. The to-do list- awaits. But, you know what? It’s a blessing to have a job to go to, a dream to work on, a way to provide for your family, and yes, a list to complete. We all know or have heard of those who are less fortunate and wish they had the life-sucking job to go to that you have (attempt at humor), the honey-do list to complete, the deadlines to meet, and the errands to run. Yes, somewhere someone wishes they were you. We don’t know who, but somewhere. Now with that reality check and as the Monday blues dissipate and you get into your day, remember how blessed you are to be right there at this moment. How awesome to use your talent to make your life and that of those around run smoothly. Now that you are thankful for the state you’re in, I want to encourage you to keep dreaming about that thing you actually desire to do, that trip you want to take, that business you want to start because, frankly, you CAN DO IT. Let this post motivate you through the week to chase your dreams and not take no for an answer. Keep believing that your dreams are worthy, and one day they will be reality. Monday undeniably can be the worst day of the week, but it is also a sign of newness. You get to start all over and each new Monday holds the promise of being better the next time around. So, get going! What will you do with your new chance at a better week to do what you want, go where you want, dream your dreams? Monday can be stressful, glorious, new, challenging, bright, but Do It Anyway! I want to encourage you to chase every dream you’ve ever had. Who knows what you will become if you look fear in the face and Do It Anyway! On the other hand, you know what you have if you do not. Go chase your dreams. You’ll be happy you did. Besides, don’t we have enough examples of “If I had only…”? Run into your destiny. I am. You Rock! And, you don’t need a man to prove it! Get dressed, get your girls, and go have some fun. Just not all the time. Somebody’s got to be the best mom ever. Question: If you give all of you away without being replenished, what good is that? Exactly. Rest is key. It is not selfish to rest. It is not selfish to say no. It is being responsible when you see that to take care of everyone else, you must first take care of you. So, when was the last time you took some “me time”? Loads to do, places to go, and people to see? Life is short. Do It Anyway!